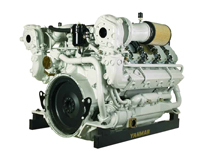 Yanmar has been manufacturing diesel engines for nearly 100 years, and their engines are designed for high performance and maximum engine life. To ensure the longevity and "as new" performance of your engine, we supply the full range of genuine replacement spares and service items delivered direct to your door. The Mercruiser range of Petrol engines suit most applications from fishing to cruising to racing. The Leisure range is available from 135hp to 425hp with the smooth shifting Alpha and Bravo stern drives. We also supply the full range of genuine service and replacement spares that will ensure your engine and drives operate at peak economy and performance.